Imagine one day you are walking along the road. You pass two policemen standing at the corner. Suddenly one of the policemen calls out, "Hey, you! You're under arrest!" 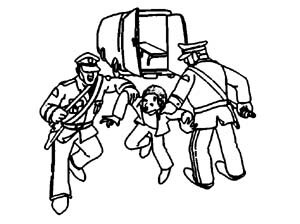 The policemen drag you off and push you into the back of a van. When you struggle they hit you over the head with their sticks and kick you. They won't tell you why you have been arrested or where they are taking you. Eventually the van stops and you are dragged out. You tell the policemen that you want to use the phone to call your family or a lawyer. No one answers you. You are thrown into a cell. You still don't know why this is happening or where you are. You lie in the cell for hours. You begin to feel hungry and very thirsty but no one comes near you even when you bang on the door. For all you know you may be locked in this cell until you die.